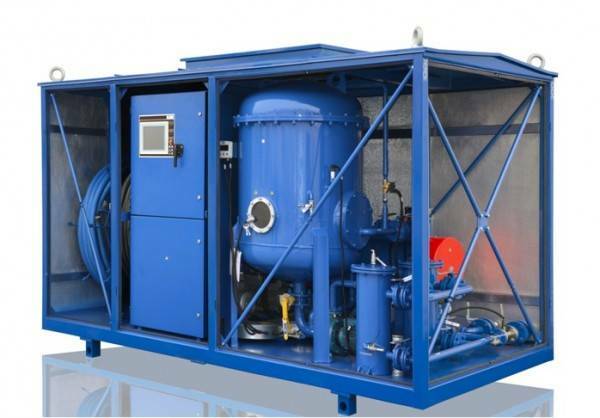 The CMM-6D degassing unit is designed for removal of particulate matter as well as heat and vacuum purification of electric insulating and turbine oils from water and gas. The unit is intended for use during installation, repairs and operation of oil-filled high voltage equipment up to 1150 kV (power transformers, high voltage switches etc). Vacuum Chamber Vessels and all internal parts are made of carbon steel and feature Coalescers, Sight Glass, Oil Level Controller and Vacuum Gauge. Vacuum Chamber’s rigid design makes it suitable for stationary and mobile installation. Appropriate flexible connections are provided to the outlet pump and inlet pump to minimize negative effect of vibration during plant operation and transportation. The primary objectives of restoring a power transformer’s insulation system are maintenance, increase of dielectric strength and reduction of insulation material aging rate. To perform transformer oil treatment like degassing, heating and filtration of solid particles, GlobeCore produces CMM-4/7 series. This equipment can also be used for heating oil-filled electrical systems with hot oil, transformer vacuum dehydration and vacuum evaporation. It will be useful for installation, maintenance and operating companies dealing with transformer oil.